REGISTER ONLINE OR PRINT FORM BELOW. 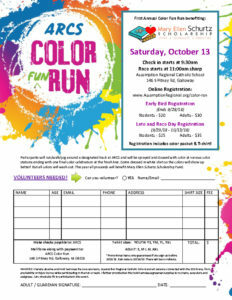 Registration includes a color packet & T-shirt! Participants will run/walk/jog around a designated track at ARCS and will be sprayed and doused with color at various color stations ending with one final color celebration at the finish line. Come dressed in a white shirt so the colors will show up better! But all colors will wash out. This year all proceeds will benefit Mary Ellen Schurtz Scholarship Fund. *Promotional items only guaranteed if you sign up before 9/28/18. Rain date is 10/14/18. There will be no refunds.